Religious hardliners are having a field day as loopholes in law threaten India‘s secular democracy. Two recent decisions by India’s Supreme Court have brought back the focus on political hate speech. On January 30, the court decided to review a set of controversial rulings – popularly known as the Hindutva Judgements, which hate-mongering politicians have been using with impunity. Then, on March 12, the court, while stopping short of cracking down on political hate speech, asked the Election Commission to examine ways of eradicating this malaise. However, a pitched battle is being waged over this between free speech libertarians and liberals, and the reasons are obvious. The libertarians swear allegiance to the Hindu Right, which comprises the Bharatiya Janata Party (BJP) as well as the more virulent and fundamentalist organisations like the RSS (Rahtriya Swayamsevak Sangh) and the Vishwa Hindu Parishad (VHP). The latter two are the BJP’s conscience keepers and are pulling out all stops to make Hindu nationalist Narendra Modi India’s next prime minister. Despite his rhetoric of development, neither has Modi desisted from unabashedly flashing his communal card, and nor has the BJP eschewed its pandering to Hindu majoritarianism. The liberal camp, on the other hand, is manned mostly by staunchly secular authors, artists and academics who want to safeguard their right to creativity, fearless expression and polemical inquiry. Keeping in mind that India is going to witness one of the most viciously polarised elections ever, it becomes both expedient and imperative to critically examine the issue of political hate speech not from the prism of freedom of expression, but from that of electoral politics. One needs to step away from Justice Holmes’ dissent in Abrams, “… the best test of truth is the power of thought to get itself accepted in the competition of the market” which is the most-cited refrain of those opposing any restrictions on freedom of expression. Since it is not the free competition of amarketplace of ideas, but a bazaar where religious and cultural majoritarianism hold sway, one ought to go by Judith Butler and Katherine Mahoney, both of whom challenge the traditional view of restrictions upon hate speech as contradictions or unjust restrictions on the freedom of expression. According to these two scholars, hate speech must be understood as hateful propaganda, primarily carried out by a dominant social and political group, rather than the mere expression of individual opinions. And history bears witness to this propaganda leading to cataclysmic consequences, most common being genocide and communal conflagrations. Hindutva is a term that was coined by Veer Savarkar, one of the RSS’ founders, in his 1923 essay “Hindutva: Who is a Hindu?” in which he expounded on his doctrine of “cultural nationalism”. It essentially meant that a person’s “Indianness” was to be determined not by geography but by a homogenised culture, a Hindu culture. This anthropological concept had concrete political moorings, and it soon became the principal poll plank of the militant Hindu Right. Time and again, communal passions have been whipped up, and legions of zealots unleashed on mosques and hapless minorities. The Babri Masjid was demolished in 1992- with senior BJP and RSS leaders leading from the front. Communal carnage of an unprecedented level was seen in Bombay (rechristened Mumbai) in 1993, instigated by Hindu demagogues’ incendiary diatribe, as the Justice Srikrishna Commission said in Chapter III of its report. And of course, there wasGujarat 2002, for which Modi is yet to be held accountable. Glorification of Hinduism in the political arena inevitably morphs into vilification of “the other”- Muslims and Christians, primarily the former. Therefore, courts have to be extra cautious in getting the context right and not conflate religion with a religion-tinged political ideology. This is where the Supreme Court erred in the Hindutva judgements. Its theological meanderings misled it into ignoring the instigative potential of the speeches in question and holding that Hindutva and Hinduism are one and the same – “a state of the mind, a way of life” synonymous witth Indianisation, and could not be equated with the narrow fundamentalist Hindu religious bigotry. Thus it ended up giving a veritable judicial imprimatur to political hate speech. The loopholes in India’s election laws exacerbate the problem. Religious electioneering is punishable as a corrupt practice, but it applies only after a candidate has officially thrown his hat into the ring. Prior to that, he has a free pass. The BJP’s Varun Gandhi cried in 2009 – “If you want to save the Hindu religion, vote for me,” and then went on a Muslim-bashing spree. He made deft use of this lacuna. Earlier, in2002 and 2007 , Modi and his cohorts did their bit of hate-mongering. The Election Commission, the constitutional body in charge of superintendence and control of elections, pleaded helplessness, contending that the law permitted it only to rebuke, not penalise. Approaching the cops proved futile because the permission of the state or central government is mandatory before commencing prosecution, and in this case, the respective governments, for reasons best termed as political skulduggery, declined. Even the Supreme Court could do little more than asking the government to remove this loophole, which hasn’t been done till date. Only in a single case has a successful candidate’s election been cancelled. But he was a low-level party functionary and had almost cooked his own goose by campaigning in temple premises and exhorting Hindu devotees to vote for him. No one, leave alone any political heavyweight, has been brought to justice for spewing venom in the name of Hindutva. 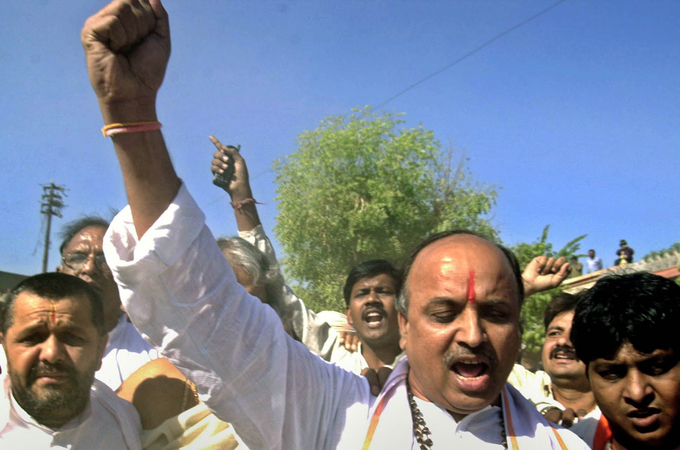 In February last year, the VHP’s Praveen Togadia engaged in a vicious anti-Muslim screed, was investigated, but the sanction to prosecute is still awaited. Those whose inflammatory speeches led to the province of Muzaffarnagar to be ravaged by a communal inferno in September last year are still enjoying impunity. There hasn’t been a graver urgency for concerted action on the part of the judiciary and legislature to rescue India’s secular democracy.